All ASUSTOR's NASes are powered by the ADM 3.0 NAS operating system with features including HTTPS admin, RAID migration, RAID Expansion, AFP, NFS, FTP, SFTP and WebDav. We last looked at the ADM operating system back in a review of ADM 2.1 in mid-2014. A significant number of changes to ADM justified the full version upgrade to ADM 3.0, briefly covered in an announcement in the SmallNetBuilder forums last year. Completely re-designed customizable desktop environment. Application icon grouping is very similar to what you find on iOS and Android devices. ADM Online Help Assistant helps users access FAQs, technical support, and the ASUSTOR download center. Application shortcuts for Photo Gallery, SoundsGood, LooksGood and Surveillance Center can be pinned to the upper right-hand corner of the desktop. The image below shows the ADM 3.0 desktop. Note that icons are grouped in folders and the customized wallpaper. Activity monitors have been added to the top bar icon (second from the right) and are displayed. I created this screenshot, as well as those in the gallery below using the Online Live Demo. The Live Demo starts you off with a brief guide and then you are free to explore the desktop and features. Note that not all of the features are "live" in the live demo, and not all features and apps will be available on all ASUSTOR NAS models. ADM 3.0.2 RA22 firmware was loaded onto the AS3102T and performance tests were run using the Revision 5 NAS test process. All tests were run using Western Digital Red 1 TB WD10EFRX (x2 SNB supplied). File copy Write and File Copy Read results were consistent across both RAID levels (RAID 0, & 1) for all three NASes. All results were above 100 MB/s and approached the theoretical limit of single client transfer on a single Gigabit connection. Similarly, all three NASes had very similar performance scores for NASPT File Copy to NAS and File Copy from NAS for both RAID levels with the exception of RAID1 File Copy To NAS for the QNAP TS-231P which was about 15% slower than the AS3102T. Neither the AS3102T nor the TS-231P has USB 2.0 ports, so no USB 2.0 backup tests were run. For the USB 3.0 backup tests, the AS3102T outperformed both other NASes for all three filesystems by a significant margin. It also had the best scores for network backup tests. Using the NAS Ranker, I filtered for RAID1 class products, test method 5 and used the default sorting by rank. The chart below shows the Total NAS scores for the six top-ranked two-bay NASes. The ASUSTOR AS3102T grabbed the #1 ranked bragging rights. 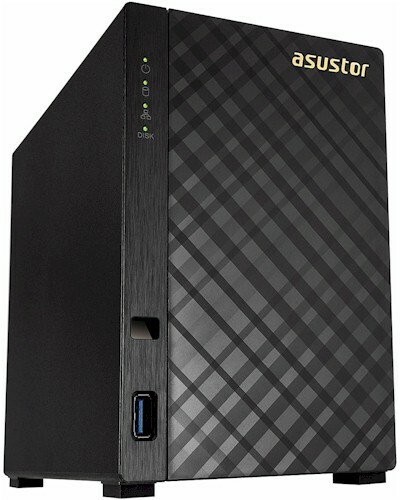 The more expensive ASUSTOR AS6102T tied for the # 4 rank with the QNAP Turbo NAS TS-251. The third product included in this review's comparisons, the QNAP TS-231P, ranked #3. With such a large price difference between the AS3102T and the TS-231P, we'll need to look at the performance summary comparison below to draw some conclusions. As noted in the chart above, the AS3102T earned the #1 ranking for Total NAS for RAID1 NASes. Looking at the subcategories, the ASUSTOR AS3102T had category wins for the Mixed Read Write, and Video, and Backup categories. Interestingly, the AS3102T earned a #2 ranking for both the Write Benchmarks and the Read Benchmark categories. The AS6102T grabbed the #1 ranking for Read Benchmarks, and the TS-231P earned the #1 ranking for Write Benchmarks. The AS3102T slightly trailed the TS-231P for the iSCSI category ranking. Ranking aside, the performance of these three products is close enough that you'd be unlikely to notice a difference in real-world use. The ASUSTOR AS3102T earned the #1 Rank for RAID 1 NAS performance. It also provides a lot of features, including HDMI output for its current $235 price. But it doesn't have hot-swappable, front-loading drives, has only one gigabit Ethernet port and is limited to its non-expandable 2 GB of RAM. The AS6102T has HDMI, dual gigabit Ethernet ports and front-loading, hot-swappable drivesranked slightly lower in some benchmarks, which I found a bit surprising. I had expected the results to be closer to the AS3102T, since both use the same processor and have the same amount of memory. It's important to note, however, that the AS6102T was tested with the previous generation of ADM (2.5.3), while the AS3102T was tested with the latest ADM 3.0.2 firmware. It's possible performance tweaks were included in the OS change that could bring the AS6102T's results more in line with the AS3102T's if we retested it. On the other hand, QNAP's TS-231P, priced at $188 as of this writing, represents an excellent value. It features hot-swappable, front-loading drives and has two gigabit Ethernet ports, but no HDMI port. And, as you can see from the Ranker Performance summary above, the TS-231P eked out the top-ranking for Write Benchmarks. However, it faired poorly for backup.